To choose a topic to address in a sacrament meeting talk a few years ago, I went to the chapter of Preach My Gospel that talks about developing Christ-like attributes. The topic that I chose was patience. It wasn’t something I’d thought too deeply about in the past, but I discovered that there’s much more to it than I had previously realized, and that it’s deeply intertwined with many of the core doctrines of the gospel and the purposes of mortal life. As both Preach My Gospel and this verse point out, when we have developed true patience, we are at peace while we wait upon the Lord, upon others, and upon ourselves. Patience is not bottling up frustrations till they exceed our capacity and explode, but the ability to delay our responses and focus on faith, allowing frustrations to dissipate and be replaced with peace. Bottled up impatience can rarely be hidden, since it has a way of creeping out in our tone of voice and actions, even when we’re trying to hide it. As I’ve thought about patience, what I’ve come to see that it is both a reflection of, and a contributor to, the strength of our faith, hope, charity, forgiveness, and many other Christ-like characteristics that we seek to develop. In fact, patience is essential to our full exercise of one of the most precious gifts that God has given us, which is free will. Patience is the ability, when those around you are making poor choices, to focus on your own options, and make your own choices. It is self-mastery, and the power to direct your own life. A man without patience is a slave to circumstance. The very test of mortal life is to prove that we will choose to, with our Savior’s help, develop a greater capacity to act for ourselves in accordance with His commandments. So developing patience is central to passing the test of life. 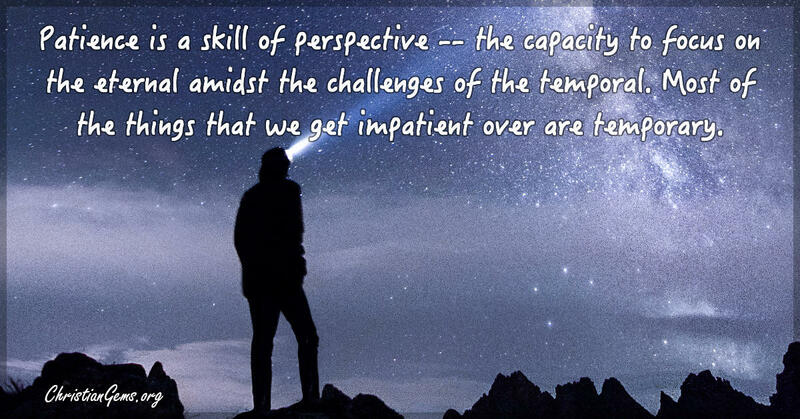 Patience is a skill of perspective. It’s the capacity to focus on the eternal amidst the challenges of the temporal. Most of the things that we get impatient over are temporary. The challenge is that they’re present and visible, while eternal things may feel distant or unsure. But as we grow in faith and choose where to keep our focus, eternal things can ultimately be the more real to us of the two. Mormon, after pointing out that if a man ‘have not charity he is nothing; wherefore he must needs have charity,’ goes on to name the 13 elements of charity, or the pure love of Christ. I find it most interesting that 4 of the 13 elements of this must-have virtue relate to patience. First, ‘charity suffereth long.’ That is what patience is all about. Charity ‘is not easily provoked’ is another aspect of this quality, as is charity ‘beareth all things.’ And finally, charity ‘endureth all things’ is certainly an expression of patience. From these defining elements it is evident that without patience gracing our soul, we would be seriously lacking with respect to a Christlike character. A dear and cherished young friend, Wendy Bennion of Salt Lake City, was such an example. Just the day before yesterday, she quietly departed mortality and returned ‘to that God who gave [her] life’. She had struggled for over five long years in her battle with cancer. Ever cheerful, always reaching out to help others, never losing faith, her contagious smile attracted others to her as a magnet attracts metal shavings. Her attitude was reminiscent of Him who bore the sorrows of the world, who patiently suffered excruciating pain and disappointment, but who, with silent step of His sandaled feet, passed by a man who was blind from birth, restoring his sight. He approached the grieving widow of Nain and raised her son from the dead. He trudged up Calvary’s steep slope, carrying His own cruel cross, undistracted by the constant jeers and taunting that accompanied His every step. For He had an appointment with divine destiny. In a very real way He visits us, each one, with His teachings. He brings cheer and inspires goodness. He gave His precious life that the grave would be deprived of its victory, that death would lose its sting, that life eternal would be our gift. Patience is the capacity to withhold judgement until our knowledge is sufficient, and to accept that it may never be. Patience chooses empathy over judgement. In the science fiction novel, Ender’s Game, the hero says, “In the moment when I truly understand my enemy, understand him well enough to defeat him, then in that very moment I also love him. I think it’s impossible to really understand somebody, what they want, what they believe, and not love them the way they love themselves.” When we have empathy, love leads to patience. Patience is the capacity to focus on the spiritual amidst the temptations of the carnal. It comes as we subject the body to the spirit, and the spirit to Christ. Patience is the ability to enjoy blessings before receiving them, by focusing on faith and hope. Romans: 8:24-25 reads, “For we are saved by hope: but hope that is seen is not hope: for what a man seeth, why doth he yet hope for? But if we hope for that we see not, then do we with patience wait for it.” Impatience, by contrast, tends to suffer in advance over tragedies that may never even happen. As important as patience is, we shouldn’t be surprised to discover that our mortal lives are designed to give us many opportunities to develop it. In our fast paced modern world, where we have instant access to practically the whole world, this can be a challenge – many aspects of life don’t force us to exercise patience the way they did generations past. But it is no less critical a quality today than it was in the past. Mosiah 23:21, speaking not of a wicked group, but of the righteous followers of Alma, says, “Nevertheless the Lord seeth fit to chasten his people; yea, he trieth their patience and their faith.” Trials are not proof of wickedness, and in fact, may at times be evidence that righteousness has prepared us for experiences that will help us in our growth and progression. By mentioning trials of both faith and patience, this verse makes it clear that faith isn’t only tried through great moments of decision, but also by long periods of endurance. We may think it unnatural to be grateful for trials, but in Romans 5:3-4, we read, “but we glory in tribulations also: knowing that tribulation worketh patience; And patience, experience, and experience, hope.” We all want hope, but to develop it, we must pass through the experiences from which it develops, and we must do so patiently. I think about Joseph Smith, who suffered illness as a boy and persecution throughout his life. Like the Savior, he cried out, ‘O God, where art thou?’ Yet even when he was seemingly alone, he exercised his agency to wait upon the Lord and carry out his Heavenly Father’s will. Our Heavenly Father and Jesus are our greatest examples of patience, and show us that we will continue to need patience throughout the eternities. The greatest scriptural examples of patience are found in the life of Jesus Christ. His long-suffering and endurance are best demonstrated on that excruciating night in Gethsemane as He uttered, in His atoning agony, ‘O my Father, if it be possible, let this cup pass from me: nevertheless not as I will, but as thou wilt’. He truly suffered and bore and endured all things. These examples of patience have greater meaning for us when we consider the admonition found in 3 Nephi: ‘Therefore, what manner of men ought ye to be? Verily I say unto you, even as I am’. We sometimes think of patience as a passive activity. But in it’s full expression, patience is active. We don’t simply sit back and wait for the Lord’s due time to send us blessings, but instead realize that often, the reason He keeps us waiting is to give us time to prepare. I learned that patience was far more than simply waiting for something to happen–patience required actively working toward worthwhile goals and not getting discouraged when results didn’t appear instantly or without effort. There is an important concept here: patience is not passive resignation, nor is it failing to act because of our fears. Patience means active waiting and enduring. It means staying with something and doing all that we can–working, hoping, and exercising faith; bearing hardship with fortitude, even when the desires of our hearts are delayed. Patience is not simply enduring; it is enduring well! 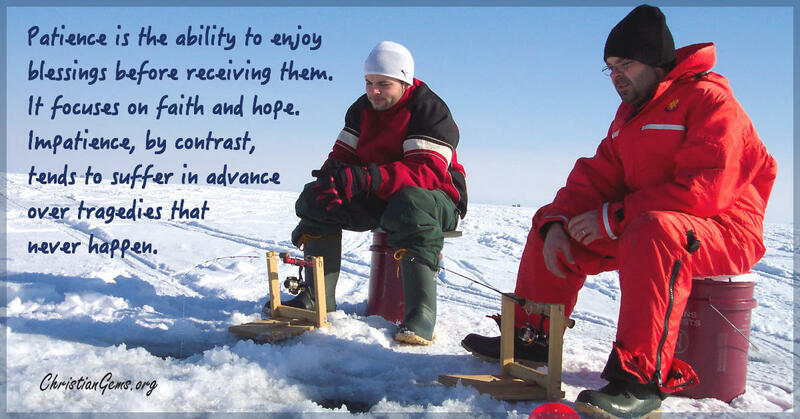 Another reason why it is important for our patience to be active is so that others can benefit from it. When I was returning home from my mission, my flight from Tokyo to Los Angeles was delayed, and the connecting flight to Salt Lake City took off about the time we touched down. In the airport, another missionary and I got in line to speak with a representative of the airline, who was trying to find new connecting flights for many of the passengers. It was already evening, additional flights were scarce, and I could see that the woman was feeling a lot of pressure. I knew that if we didn’t get a flight that night, arrangements would be made, and everything would work out fine. So I was patient. But it wasn’t until I demonstrated that patience by asking a question about her name – she was Japanese American – that she felt it, and was able to relax, at least until she got to the next passenger. We should learn to be patient with ourselves. Recognizing our strengths and our weaknesses, we should strive to use good judgment in all of our choices and decisions, make good use of every opportunity, and do our best in every task we undertake. We should not be unduly discouraged nor in despair at any time when we are doing the best we can. Rather, we should be satisfied with our progress even though it may come slowly at times. We should be patient in developing and strengthening our testimonies. Patience with family members and others who are close to us is vital for us to have happy homes. However, we often seem more willing to be courteous and polite with strangers than with those in our own family circles. For some reason, criticism, sharp language, and quarreling too often seem to be acceptable at home but not away from home. Parents, be patient with your children. Read to your little children and help them with their schoolwork, even if you need to tell or show them the same thing many times. Elder Richard L. Evans said, ‘If they find that they can trust us with their trivial questions, they may later trust us with more weighty ones’. Lastly, how do we develop patience? In part, we need to develop the willpower to refuse to give in to ungodly impulses. But the greater goal is to experience a change in nature. 1. Read each of the scriptures in the Topical Guide listed under the topic “patience” and then ponder Christ’s patient examples. 3. Become sensitive to the examples of patience and of impatience that occur around us every day. We should strive to emulate those individuals we consider to be patient. 4. Recommit each day to become more patient, and be certain to keep our selected family member involved in our patience project.